You always make sure to brush your teeth twice a day to maintain optimal health, but are you using the right toothbrush? All of us at The Center for Cosmetic & Restorative Dentistry in Chesapeake want to make sure that our patients not only understand the importance of regularly brushing their teeth, but also that they know whether they are choosing the right toothbrush at their pharmacy or grocery store. With so many options to choose from, selecting a toothbrush often comes down to which color is liked best and which is cheapest. However, not all toothbrushes are equally safe and effective at thoroughly cleaning your teeth. 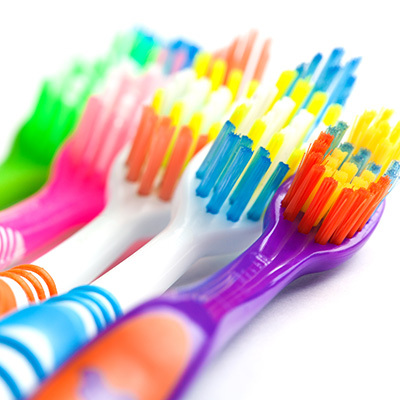 One of the most important parts of a toothbrush to take into consideration is the type of bristles. The design of the bristles, whether they are straight, slanted, or uneven, doesn’t really matter too much as it’s more important to have a proper brushing technique. However, the texture of the bristles is really important to note. Toothbrushes come with either soft or hard bristles, and while it may seem like common sense that hard bristles would more safely remove plaque and bacteria, the opposite is actually true. Hard bristles can cause damage to the surface of the teeth and irritate the gums, whereas soft bristles offer a more gentle clean. In fact, the American Dental Association (ADA) recommends soft-bristle toothbrushes for safe and effective cleaning. The size of the toothbrush handle and head are also important features to think about when choosing the right toothbrush. The size of the head should easily fit into the mouth and comfortably reach the back teeth. Those with a smaller mouth will benefit from a small head or even a youth toothbrush. The size of the handle should be comfortable to hold and should be long enough to reach the back teeth without causing discomfort. Lastly, as we all know, there are two options of toothbrushes to choose from – manual and powered. Is one better than the other? According to the ADA, both types of brushes are effective at thoroughly cleaning teeth and the choice between the two is a personal preference. What’s most important is that you’re comfortable with your toothbrush and that you use it twice a day. Using the right toothbrush is just a small part of a healthy oral maintenance routine. While Dr. Tanya Brown and all of us at our Chesapeake dental office want to encourage our patients to maintain proper oral hygiene at home, we also want to express the importance of keeping up with your regularly scheduled professional cleanings and checkups for optimal oral health. If you’re due for a checkup or hygiene visit, give us a call to schedule your appointment today!